Cervical Spondylitis is a disorder in which a person suffers from chronic neck pain. Most commonly upper cervical vertebrae get affected. There are degenerative changes in the vertebrae. People after middle age get affected more. There are changes in the bones of the neck with aging. There is stiffness of the neck and numbness in the arms and hands. Generally, people suffering from neck pain or cervical spondylosis take pain killers to get relief. Regular intake of painkillers may produce many side effects. There are many herbal and natural remedies for neck and backache. People who suffer from neck pain also have backache. There is stiffness and pain the lumbar region. Home remedies for cervical spondylitis also help in giving quick relief from pain and stiffness in the back and neck. Backache home remedies help in natural treatment of the backache without producing any side effects. Natural remedies help in cervical spondylitis treatment in a natural way. There is wear and tear of the tissues and bones of the neck which causes pain and stiffness of the neck. It is a common health problem that affects people of all ages. There is compression of the nerve root which causes pain in the neck. There is stiffness and pain in the neck. Headache and vertigo may be accompanied along with stiffness of the neck. The patient feels vertigo on standing and while moving and wants to lie down immediately. There may be some other reason as well for vertigo, therefore, definite diagnoses has to be done. Pain from the neck radiates to the arms. There is feeling of numbness in the fingers and sensation of pricking of needles. There is loss of sensation in extreme cases of cervical spondylosis in the hands and feet. There is difficulty in walking due to muscle in coordination. Patient cannot stand still, he feels trembling of legs on standing. Cannot walk for a longer time period. Driving a vehicle becomes difficult as it aggravates the condition and also there is vertigo in the head. People suffering from cervical spondylosis may also have pain in the back and it becomes difficult to stand erect. Ekangaveer Ras 10 gm, Praval Pisti 10 gm, Brihad vat Chintamani Ras 1 gm, Swarn Maksik Bhasm 10 gm, Trayodashang Guggulu 40 gm and Chandraprabha Vati 40 gm. Divya Ekangaveer Rasa: This is a natural and herbal remedy used for the treatment of cervical spondylitis and backache. This remedy has been traditionally used for getting relief from pain in the neck and back. 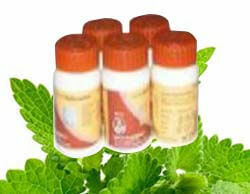 Anyone who takes this herbal remedy regularly will get relief from pain and stiffness of the neck. Divya Pravala Pisti: This herbal remedy is one of the best remedy for the treatment of cervical spondylitis and backache. It provides nourishment to the vertebrae and helps in reducing pain and stiffness of the neck. Divya Brihad vat Chintamani Ras: It is a great natural remedy to get relief from symptoms of cervical spondylitis. This enhances the energy and power to bear the pain and stiffness. It increases the strength of the vertebrae and reducing tingling sensation in the arms and legs. Divya Swarna Maksika bhasm: This herb is used for the cervical spondylitis treatment and provides long lasting results from pain in the neck. It increases the strength of the nerves and reduces the numbness of the fingers by increasing the nervous strength. Divya Trayodashang Guggulu: It is one of the wonderful herbs for any kind of pain. It helps in reducing the pain in the back and neck by providing essential nutrients to the muscles of the back and neck. It acts as a tonic for the muscles of the neck and back to give relief from pain. Divya Chanderprabha vati: This herbal remedy helps in the treatment of cervical spondylosis and backache in a natural way. It is an effective herbal treatment for any kind of pain in the neck and back. Regular intake of this herb helps to increase the strength of nerves and muscles of the neck and provides immediate relief from long standing stiffness of the neck. Sesame oil is good for doing massage of the neck muscles and the whole body. After doing the massage you can apply hot fomentation to get immediate relief from stiffness and pain the whole body. Garlic is another useful home remedy for cervical spondylosis. Garlic has anti-inflammatory and analgesic properties due to which it is a useful remedy for any type of pain and stiffness. Eat one or two cloves of raw garlic early in the morning. Make powder using dry ginger root, cumin seeds and celery seeds. Add all the three things in equal amounts and add a pinch of rock salt to it. Take one teaspoon of this mixture everyday at night before going to the bed with water. Exercise of neck readily helps in reducing pain and stiffness in most cases. Try to do mild exercise of neck daily to reduce stress and stiffness of the neck. Eat healthy diet to increase the nutrient intake. A healthy diet is very essential for optimum functioning of different body parts. Some people use neck collars to keep the neck straight. It helps in reducing pain and stiffness of the neck naturally. Do not keep your neck in the same posture for longer time period. When you are working on a computer take breaks at regular intervals of time to change your position. Do not lift heavy objects as it may produce stiffness of the neck and sprain in the back. Do not use heavy pillow while sleeping. Always sit in a good posture to avoid pain in the neck. Proper sleep of seven to eight hours is necessary to reduce pain and stiffness of the neck. Avoid eating fried foods, eat simple food which is easily digestible and provide adequate nutrition to the muscles and tissues of the neck. Take a glass of water and add juice of one lemon in it with a pinch of roc salt. Drink it three times in a day to get relief from pain in the neck.